When the first ceremony was held in New Hampshire back in 1993 discussions of a monument began to form. Those discussions grew louder and a committee was formed to investigate viability, location and cost. 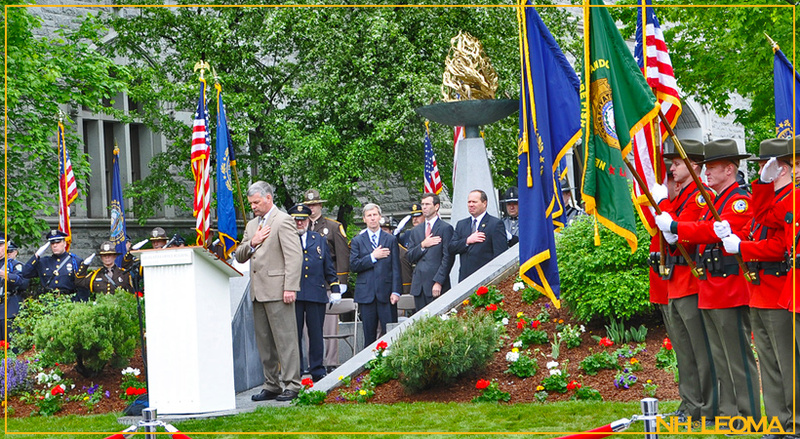 The primary goal of the NH Law Enforcement Officers’ Memorial Association, more than 25 years ago, was to plan the design and construct a memorial befitting of the courageous men and women protecting our communities, as well as those who had tragically lost their lives in the course of doing so. This page outlines some of the details surrounding the Memorial’s planning and development, as well as highlighting a few things you may, or may not know about the Monument itself. 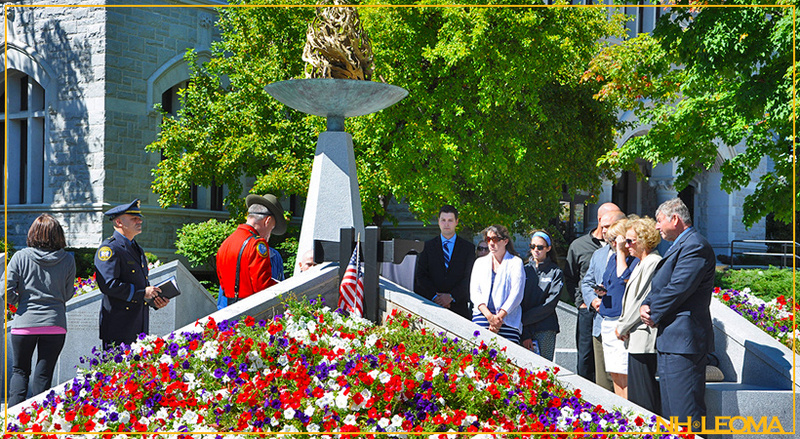 The dream of a permanent Memorial honoring all New Hampshire Law Enforcement Officers, with special homage to the officers who had died in the line of duty, began in 1993. Through the hard work of a chosen few, and the invaluable financial contributions of caring individuals and corporate leaders, the project and dream was realized in 1995. The sculptor, Emile Birch, was commissioned to design the Memorial. His design and vision, which he coined “The Eternal Shield,” utilizes the form of the star shield, a symbol of the Eternal Star, that exemplifies the role of the hero and articulates the concept of the radiant light of peace. 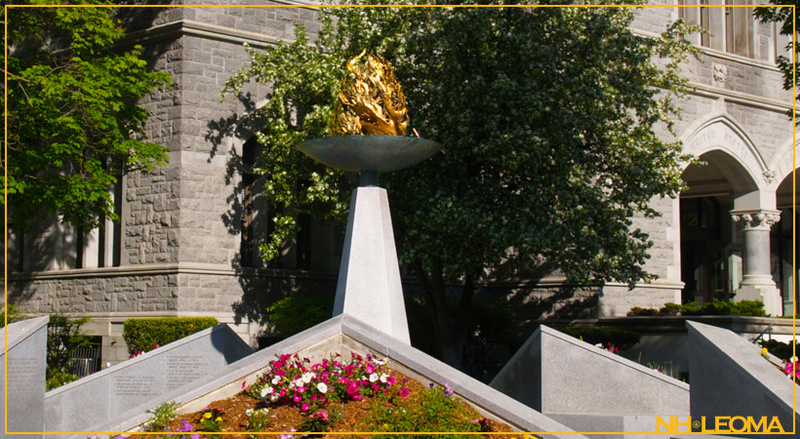 The Memorial, which consists of five sanctuaries, is fabricated from New Hampshire granite. 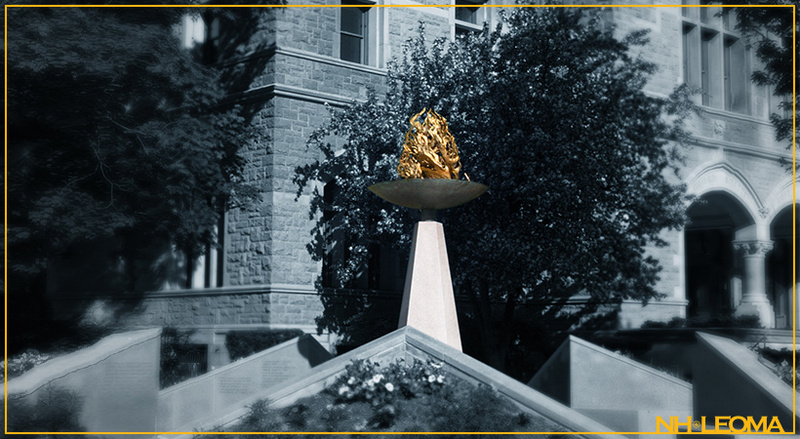 At the center of the sculpture is a gold-leafed, bronze, eternal flame, also in the shape of a star shield. 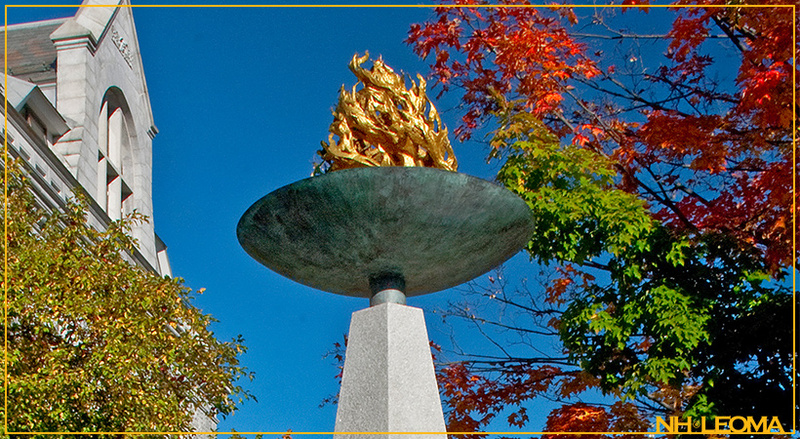 The eternal flame form is set atop of a granite column of similar design. 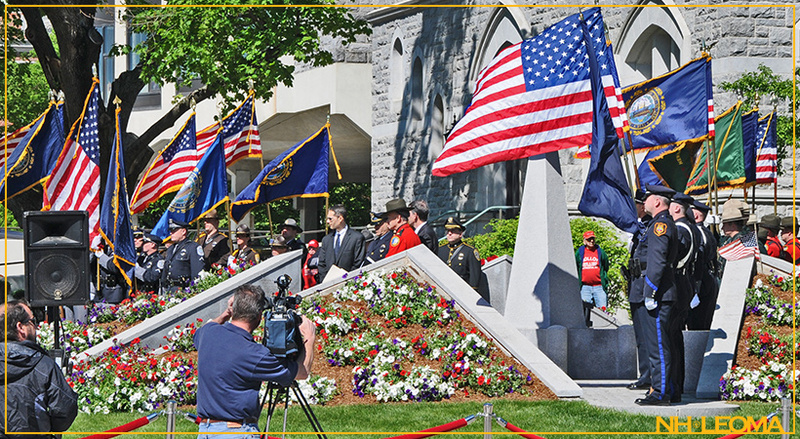 Cast at the base of the column is an officer’s badge from each agency within the State of New Hampshire—a symbolic act of unity in celebration of a place where heroes are forever remembered. 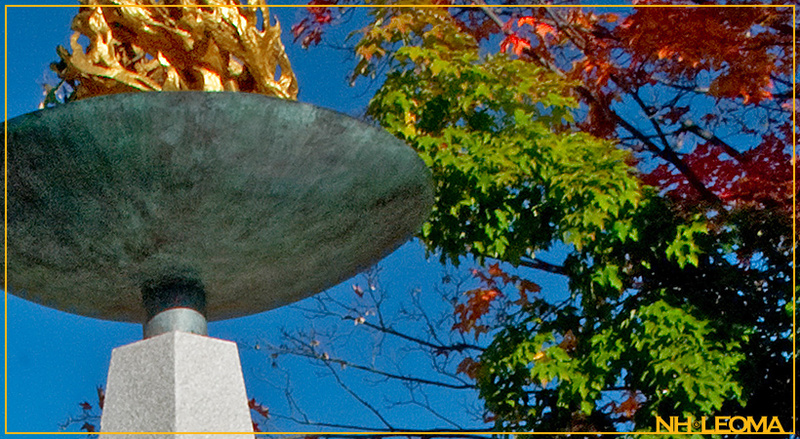 The New Hampshire Legislature chose a very appropriate site for the Memorial to be designed within and installed on the front lawn of the Legislative Office Building in Concord, NH. This location is a place where our youth will learn and adults can reflect on the important role of law enforcement within our communities. 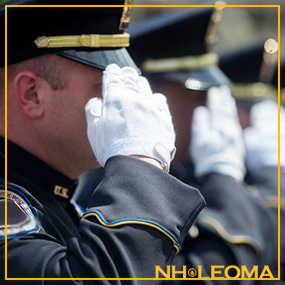 A place where all law enforcement officers can remember their fallen brothers, sisters and the survivors. The names of forty fifty (50) officers are inscribed on the sanctuary walls within the memorial. Each of these individuals has sacrificed their life, in the service of protecting the communities, neighborhoods and homes of New Hampshire. The service of these heroic individuals spans more than 128 years, beginning with the first recorded line of duty death in 1886, to the last, recorded in 2014. Through the creation of this memorial, we shall never forget the heroic service of these individual officers—their names will forever be carved within the walls of this memorial sanctuary. 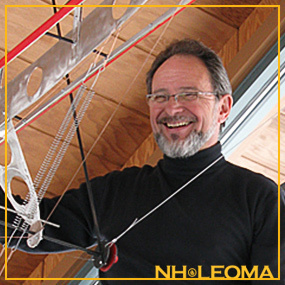 Noted sculptor, Emile Birch, is known for the many public sculptures he has created during the twenty years he has lived in New Hampshire. A few of his most notable bodies of work are referenced below. His work includes “The Wilderness Gate”, commissioned by Chubb Life America. It is sited in the courtyard of their corporate headquarters in Concord, NH. “The Sunapee Mandala” was commissioned by the State of New Hampshire to celebrate the fifth anniversary of Sunapee Park. “The Founder’s Gate” was commissioned by the Historical Society of Exeter, NH as the focal point of Founders Park and was commemorated during the three hundred and fiftieth anniversary of the town. My path as a sculptor has taken me in two similar, but distinctly different directions. The first is my work creating commissioned public sculptures. The spirit of each of these pieces springs from the aspirations of the communities that I work with. My goal is to express those needs meaningfully in a sculptural vocabulary of durable materials and space. The other direction that I have followed with great enthusiasm is my work as a teaching artist. There I have collaborated in sculpture projects with communities, children in schools, senior citizens, the differently able, and those incarcerated in our prisons. My intention in all of these collaborations has been to help others create a personal art that will become a gift of public sculpture. Read on, as well as learn more about Emile Birch, on his website. In 2016 the Memorial Association released the first ever challenge coin to honor and promote the NH Law Enforcement Memorial, and to serve as a fundraiser to help defray the costs of the annual ceremony. Our challenge coins can be purchased for $15 from any Memorial Committee Member, or at any fundraising event sponsored by the Memorial Association. In the near future, these challenge coins will be available for purchase on this website. “The Memorial Monument portrayed on the front of this challenge coin was designed by sculptor Emile Birch of Canaan, NH and was dedicated to the NH Law Enforcement Community during a public ceremony in 1998. Also in 1998, the unique badge design portrayed on the reverse side of this challenge coin was developed by the Memorial Association. For the badge design, a star shield is an accepted universal symbol for law enforcement, a symbol of the eternal that exemplifies both the role of the hero and articulates the concept of the radiant light of peace. 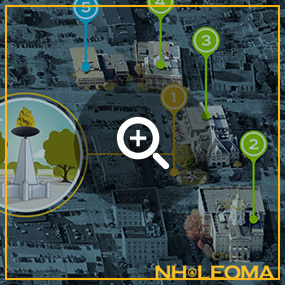 While a star shield appears to be the focal point of the badge it is actually an aerial view of the Memorial Monument.